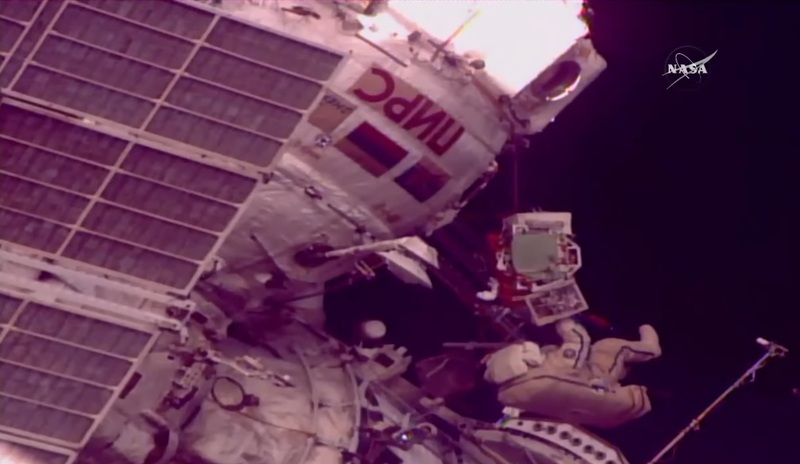 Veteran spacewalkers Aleksandr Misurkin and Anton Shkaplerov spent eight hours and 13 minutes outside the Station, facing a task involving a high-gain antenna not designed to be serviced by spacewalking crew members. Dealing with tight clearances, tedious bolt manipulation and numerous electrical & data connectors, the duo successfully removed an out-of-date electronics box and threw it overboard as a means of disposal before installing a new & improved unit that is compatible with the current generation of Luch relay satellites to give ISS additional downlink bandwidth and support the constantly-growing data stream from the orbiting complex. 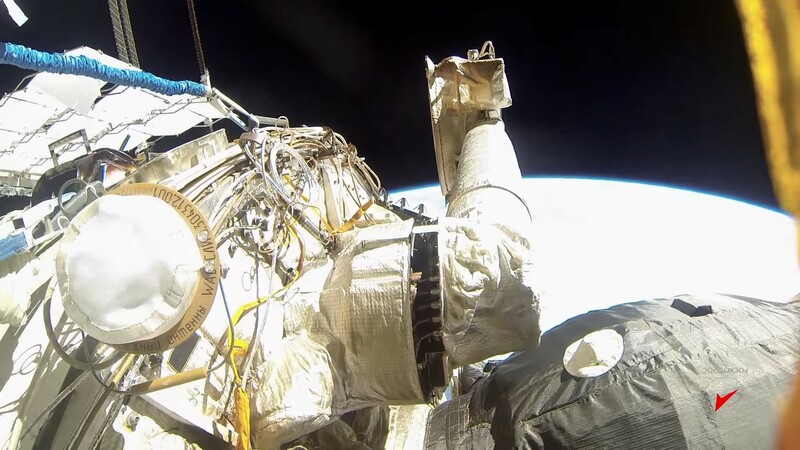 EVA-44 now ranks as the longest Russian spacewalk in history, surpassing the previous record set by Oleg Kotov and Sergey Ryazanskiy in 2013 by six minutes. 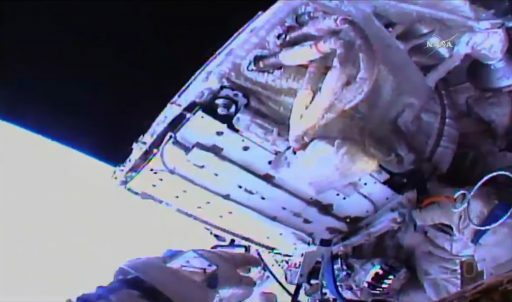 Overall, Friday’s EVA ranks as the fifth-longest spacewalk in human spaceflight history. Friday’s Spacewalk marked the 207th EVA dedicated to ISS Assembly, Maintenance & Upgrades, and the second EVA of 2018 following last week’s spacewalk on the U.S. Segment to provide the Station’s Canadarm2 robotic arm with its second new hand to rejuvenate the vital robotic asset for the Station’s final decade of operations. 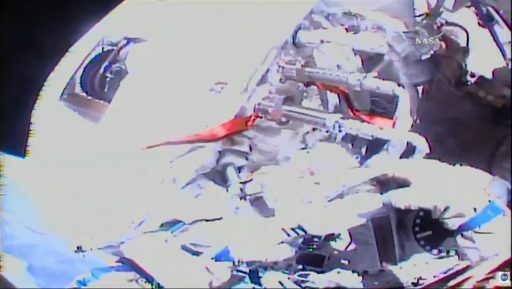 Another U.S. Spacewalk will be coming up on February 15 to re-shuffle the Latching End Effectors removed from Canadarm2 to return the one in worse condition to Earth while the still-functional unit takes a new role on an external payload holding platform. The Russian EVA effort in 2018 will be focused on two major objectives: a) outfitting the Zvezda service module with new communications gear to finally allow for near-continuous communications relay through Luch, and b) prepare for the departure of the Pirs module and the arrival of the MLM Nauka module that will give the Russian segment a state of the art laboratory and an additional crew quarters. Friday’s EVA set out to revamp the Lira communications system with new electronics, compatible with the third-generation Luch system that functions in a similar capacity as the American Tracking and Data Relay Satellite System to provide two-way communications with crewed and uncrewed spacecraft in lower orbits. Luch currently operates three satellites parked in Geostationary Orbit, capable of two-way communications with the International Space Station, Russia’s Soyuz spacecraft and various satellites in lower orbits to allow Mission Control to remain in contact with critical assets for the entirety of their orbital treks around the planet. 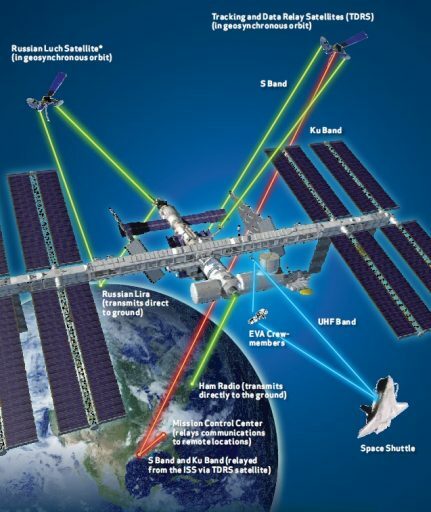 The Luch system also supports telemetry relay from ascending launch vehicles, carries P-Band equipment for the reception of distress beacons and hosts L-Band equipment to provide augmentation signals for the Russian Glonass Navigation System. 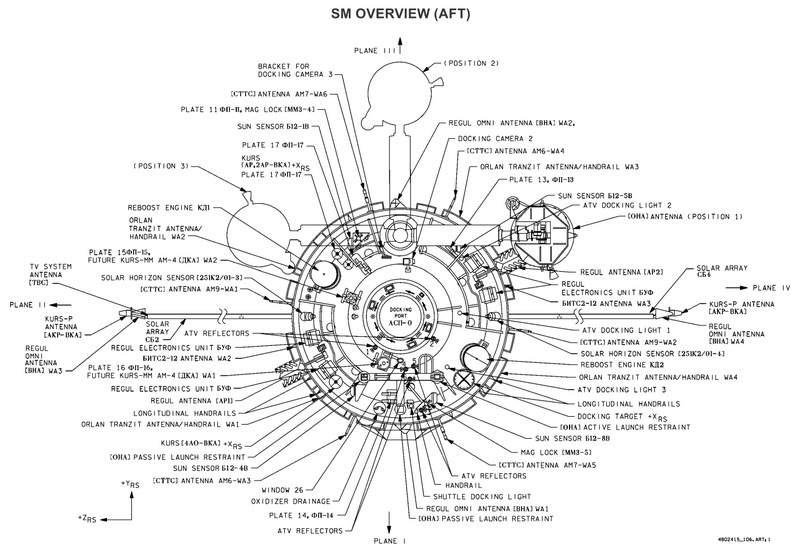 The Russian high-altitude relay system finds its origin in the mid-1970s when development of the communications architecture was started to support Russia’s Salyut and Soyuz programs. Four first generation satellites – code named ‘Altair’ – were launched from 1985 to 1994 but experienced a number of technical issues and most fell short of their five-year design lives. A second generation of satellites, called ‘Gelios,’ only saw one satellite reaching orbit while another was destroyed in a fire and never replaced due to financial problems. In the 1990s, Luch was only at operational strength for just over a year, delivering near-continuous communications between Mission Control and the Mir Space Station. 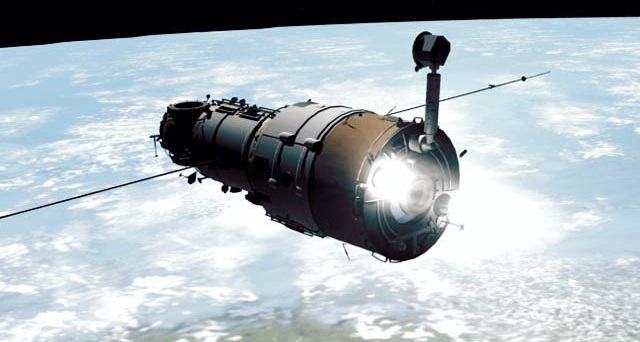 With no money to launch new satellites and Mir believed to be well on its way toward retirement, the Russians decided to abandon the Luch project for the time being. Little did they know that Mir would continue hosting crews until mid-2000, forced to revert to the old ways of only communicating with Mission Control when within range of Russia’s ground station network. When the Zvezda Service Module launched to the growing International Space Station atop a Proton rocket in July 2000, it was outfitted with a pair of communications systems – Regul for two-way communications through Russia’s ground station network, and Lira for high-bandwidth space-to-space communications through Luch, compatible with the second-generation (Gelios). The plan was for Luch services to be re-established in Geostationary Orbit shortly after ISS began permanently crewed operations. However, funding problems were the major problem the Russian space program was faced with through the 1990s and into the 2000s – delaying a number of satellite projects, including Luch. When Roscosmos contracted ISS Reshetnev for the next generation of Luch satellites, the state of technology had progressed well beyond the second generation the Lira System on Zvezda was designed to work with. Three Luch Satellites were launched atop Proton rockets between 2011 and 2014 and have since started supporting various satellite missions as well as the new series of Soyuz MS spacecraft that is equipped for communications through Luch via S-Band phased array antennas. The Luch-5 satellites can support S-Band communications up to 5 Mbit/s and Ku-Band communications through the revamped Lira will have data rates of 150 Mbit/s per channel – allowing it to carry various voice loops, video feeds, telemetry data and high-rate science data from experiments on the Russian Segment – also easing the load on TDRSS which could be re-allocated to payloads on the U.S. Segment or outside ISS where a number of remote-sensing instruments took up residence in recent years. Now over 17 years old, most of which was spent dormant in a stowed position, the Lira antenna outside Zvezda remains functional, but its electronics needed a major overhaul to be able to communicate through the current Luch System. 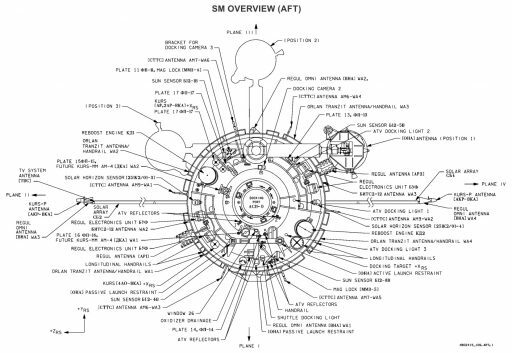 Unfortunately, Lira was not designed to be serviceable in orbit which represented the primary challenge for Russian EVA-44. Fourth-time spacewalker Aleksandr Misurkin and second-time EV crew member Anton Shkaplerov officially began their excursion at 15:34 UTC on Friday when the Pirs airlock reached vacuum and its hatch was opened by lead spacewalker Misurkin. In use by Misurkin was the upgraded Orlan MKS No. 4 space suit that was first tested last year while Anton Shkaplerov wore one of the older Orlans, MK No. 6. After moving equipment outside Pirs, including the new electronics assembly, Misurkin and Shkaplerov made their way to the aft end of the Zvezda Service Module where they set up shop to begin working their only EVA task. First, they unlocked the Lira antenna assembly which had been secured in a stowed position while not in use. 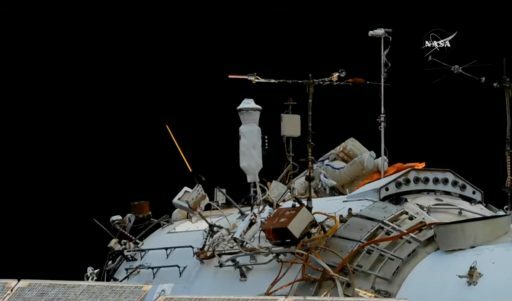 Via ground command, Lira rotated to its launch position in front of the aft docking port on Zvezda where the antenna assembly could be accessed by the EVA crew members. 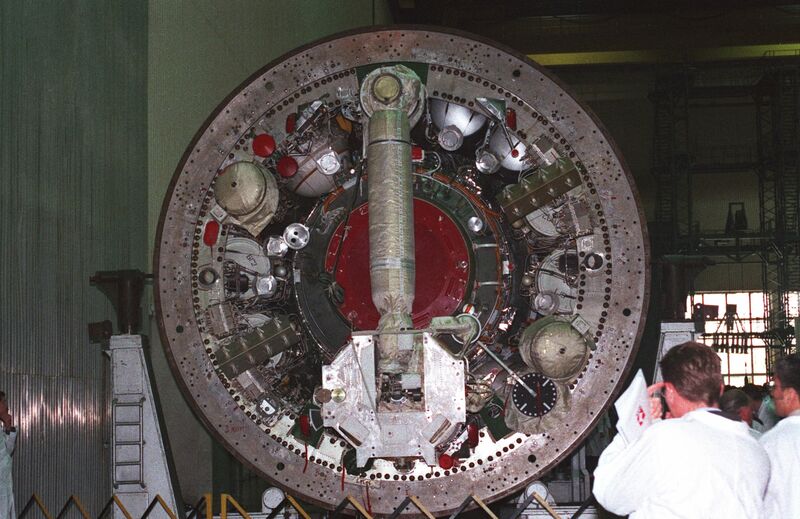 Next was the core challenge of the EVA: removing the old ShA-317A-II radio receiver containing the waveguides and support electronics for the Lira antenna assembly. Armed with three purpose-built tools, Misurkin and Shkaplerov began working to release around a dozen screws using different wrenches to loosen the unit from its frame, then using a pair of handles to gently pull it clear and working with scissors to cut lanyards before demating electrical/data connectors. Although the crew fell nearly an hour behind the timeline, both Cosmonauts remained professional and dealt with one problem at a time and eventually managed to release all screws and the low/high-frequency connectors. 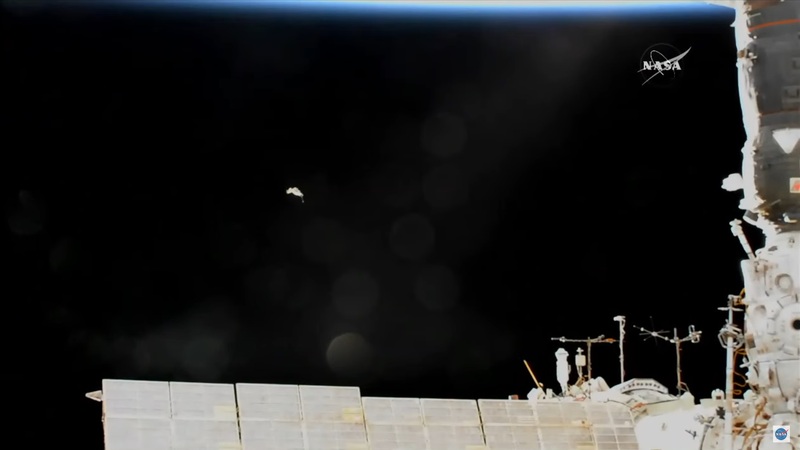 With the unit removed, Aleksandr Misurkin re-positioned himself and disposed of the 30-Kilogram piece of equipment by throwing it away at 19:40 UTC into a retrograde & nadir direction to enter an independent orbit below ISS from which it will decay within around a year’s time. 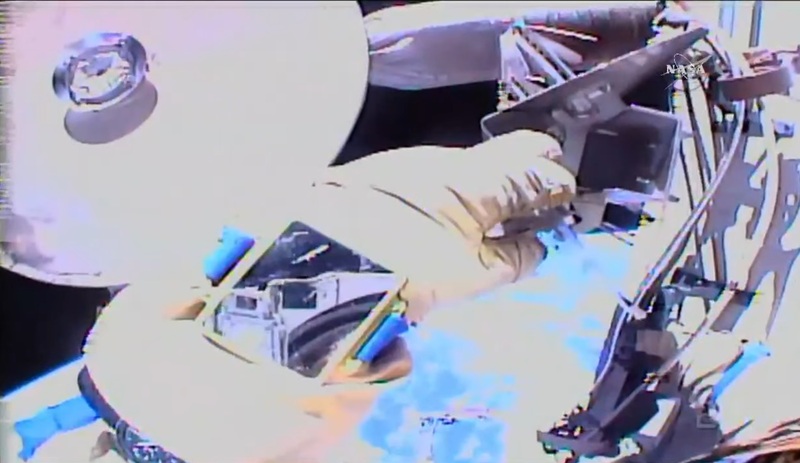 The new unit was designed to fit into the slot on the Lira antenna but to also have provisions for ease-of-use by EVA crew members such as handles for simple maneuvering/installation and wing nuts that can be turned easily while wearing thick space suit gloves. With these design features, installing the new ShA-317A-II presented no challenge to Misurkin and Shkaplerov who made quick work bolting the 60 x 45 x 15-centimeter unit into place followed by re-connecting power, low- and high-frequency communication lines between Zvezda and Lira. Mission Control Moscow reported at 21 UTC that the system was successfully powered up and responding to ground commands as planned, indicating the installation was a full success. 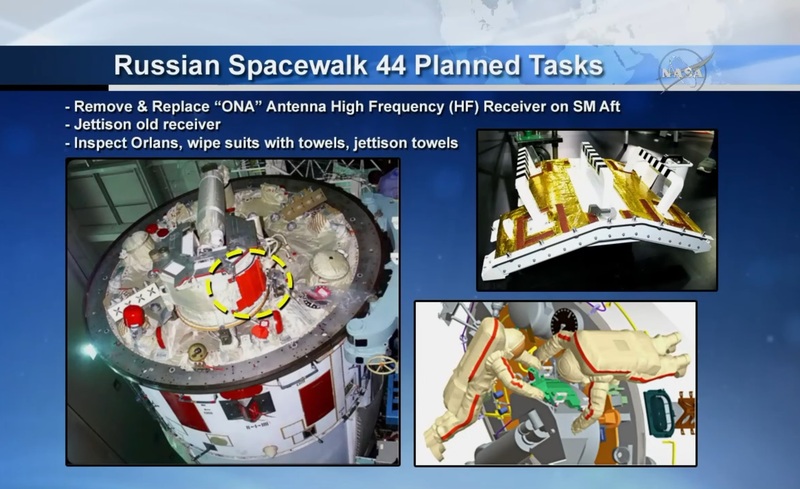 The Cosmonauts then pressed into removing the handles from the newly installed unit, configuring insulation blankets and cleaning up the worksite before unlocking the Lira assembly once again to allow the antenna to move into its deployed configuration from where it can track Luch satellites in Geostationary Orbit. During commanding by Mission Control, the Lira boom apparently got stuck on the docking target installed on Zvezda for the European ATV cargo spacecraft and the Spacewalkers needed to assist the antenna boom past the obstacle, but attempts to move the boom further showed no motions. After three attempts without movement, the Cosmonauts were instructed to deliver some elbow grease and move the boom manually as close as possible to what is known as Position 1 and re-commanding it into electrically-driven motion appeared to do the trick as Lira went back into motion. However, Lira apparently overshot its target by 180 degrees and reached a stop in its Position 3 configuration. Given the advanced stage of the EVA and prior problems with moving the boom, Mission Control accepted the situation as is since Lira can operate nominally from either position and Position 3 also provides proper clearance of the Zvezda docking port. Engineering teams will look into the problems seen during the EVA and also evaluate whether the antenna can remain in Position 3. Friday’s EVA ended at 23:47 UTC when the crew had returned to the Pirs airlock and locked its external hatch after a record-setting EVA duration eight hours and 13 minutes and a job well done by the Cosmonauts. Aleksandr Misurkin, now with four EVAs under his belt, stands at a career spacewalking time of 28 hours and 14 minutes while Anton Shkaplerov accumulated 14 hours and 28 minutes on his two EVAs. Friday’s excursion brought the total time spent spacewalking outside ISS to 1,294 hours. Engineering teams in Moscow will work through analysis of the Lira position over the coming days, looking at why the commanded rotation drove the antenna to Position 3 and whether nominal operations will be possible. When the Russian Segment will begin using Luch on a regular basis has not been specified by the Russian Space Agency.